WASHINGTON — The Supreme Court has turned down an emergency appeal from a New Jersey man who says President-elect Barack Obama is ineligible to be president because he was a British subject at birth. The court did not comment on its order Monday rejecting the call by Leo Donofrio of East Brunswick, N.J., to intervene in the presidential election. Donofrio says that since Obama had dual nationality at birth _ his mother was American and his Kenyan father at the time was a British subject _ he cannot possibly be a "natural born citizen," one of the requirements the Constitution lists for eligibility to be president. At least one other appeal over Obama's citizenship remains at the court. Philip J. Berg of Lafayette Hill, Pa., argues that Obama was born in Kenya, not Hawaii as Obama says and the Hawaii secretary of state has confirmed. Berg says Obama also may be a citizen of Indonesia, where he lived as a boy. Federal courts in Pennsylvania have dismissed Berg's lawsuit. 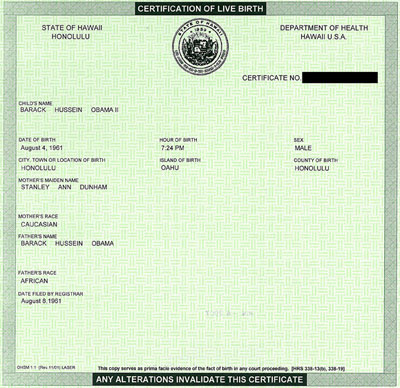 B4B NOTE: For any other GOP morons out there who may wonder if Obama was born in America, just forward the above picture of his birth certificate.